This example involves four virtual machines: controller - VM1, two web servers - VM2; VM3, SQL Server database - VM4. Domain – domain name, UserName – account. 4. Prepare and configure the controller server. It does not have to be a very powerful machine; it serves as a router, that redirects incoming requests. ELMA users will connect to this machine, and it will redirect their requests to the web servers (more powerful machines). 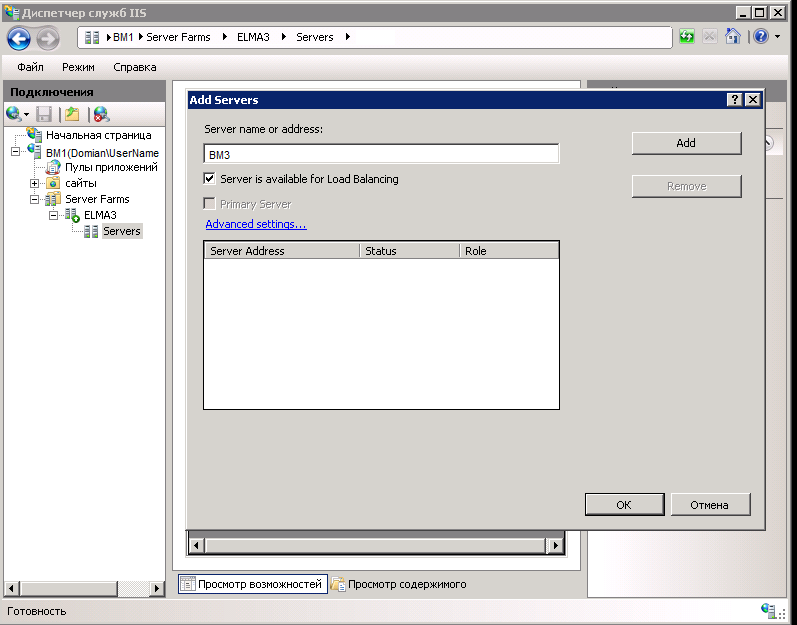 Configuring MSSQLServer 2008 on VM4. If you have already configured signing in with the sa account, then you can skip steps 1-10. 1. 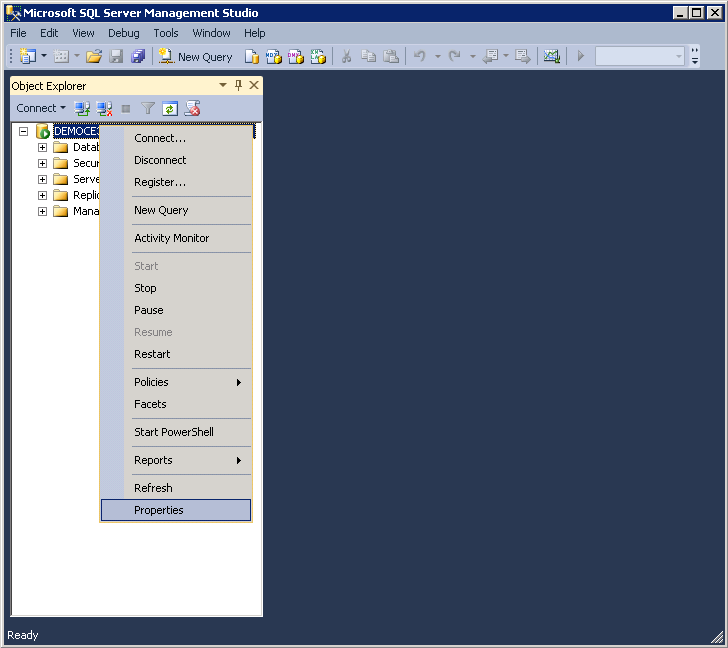 Open to MS SQL 2008 Start -> SQL Server Management Studio. 2. Go to Security -> Logins - sa login, General page. 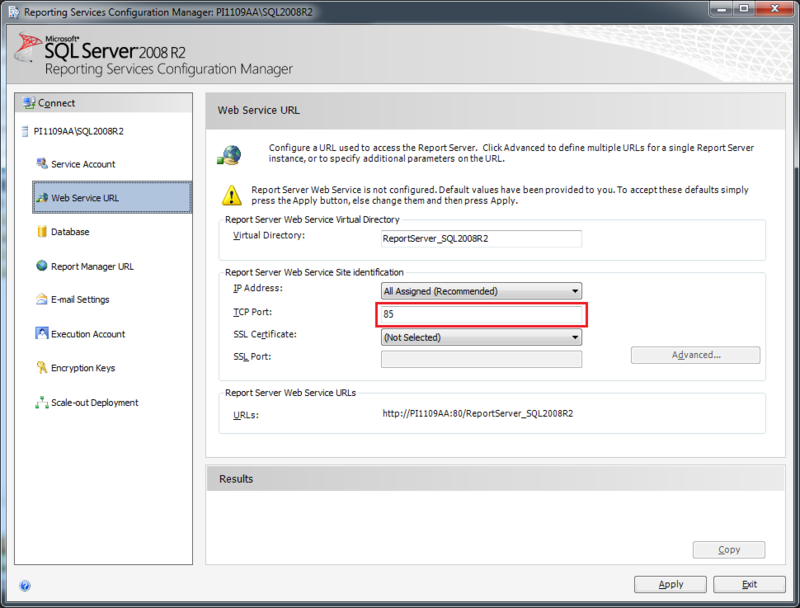 find the MS SQL 2008 service and Restart it. 12. Create a database, since the farm cannot create one (e.g. ELMA4). 1. 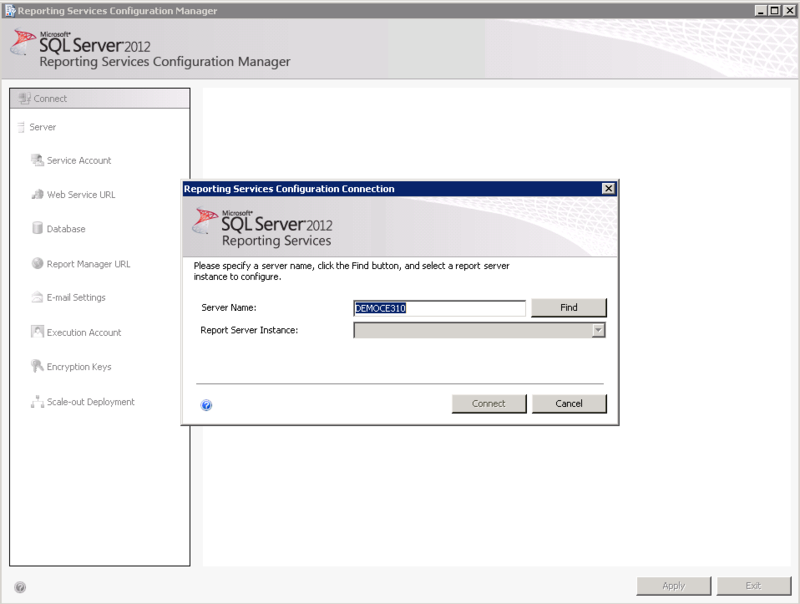 Open the Reporting Services configuration manager Start ->All Programs->Microsoft SQL Server 2008 R2 ->Configuration Tools ->Reporting Services configuration manager. 5. Stop the SQL Server Reporting Services. 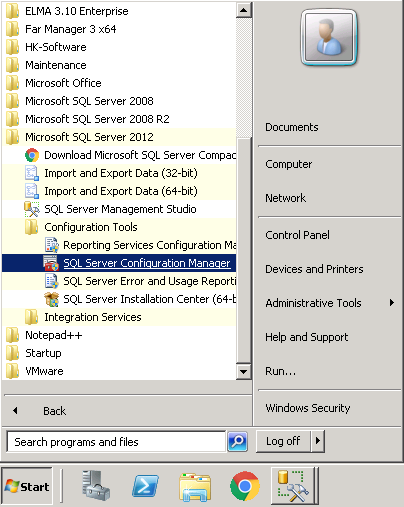 In the SQL Server configuration manager Start ->All Programs->Microsoft SQL Server 2008 R2 ->Configuration Tools ->SQL Server Configuration Manager find SQL Server Reporting Services and click Stop. Configure FastReport fo all the VMs, where MS SQL Server is installed. Installing and configuring farm servers. 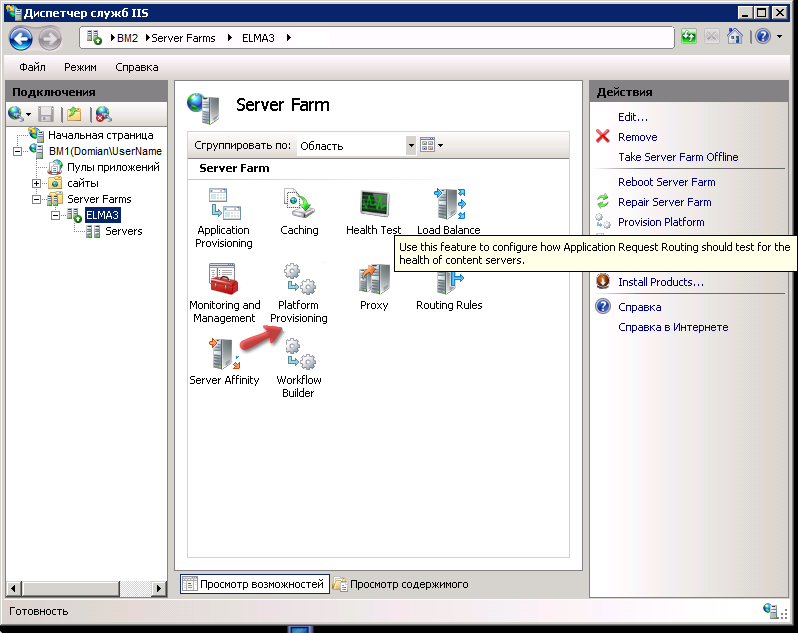 Install ELMA3 Enterprise on the farm machines: VM2; VM3. Leave the following default settings unchanged. 4. 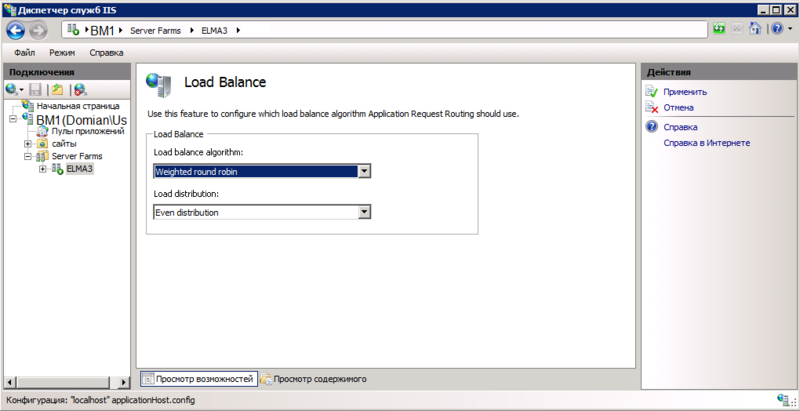 After installing ELMA on VM2, VM3 do not start the servers; on each VM, stop the ELMA3-Enterprise site and pool, since it is necessary to configure the server pools and configuration files. 5.1. Set the Idle Time-out (minutes) to 0. The default value is 20 minutes. It means, that the application pool will go to the sleeping mode if it is idle (does not receive a request for 20 minutes). By setting the 0 value, you disable this feature. 5.2. Set the Regular Time Interval (minutes) to 0. It is necessary to avoid delays and errors that occur in the case of a timeout or an unexpected restart since all the HTTP requests and responses go through an application request routing system. (VM4 is the name of the VM with SQL Server; ELMA4 - database name; ID=sa; Password=!Q2w3e4r5t the SQL log in parameters are as configured in the first section). specify the path to the network file folder. (ELMA; ELMA_NH; ELMA_NH_Locks; 22233; - these settings are taken from the cache settings with the AppFabricCacheService. 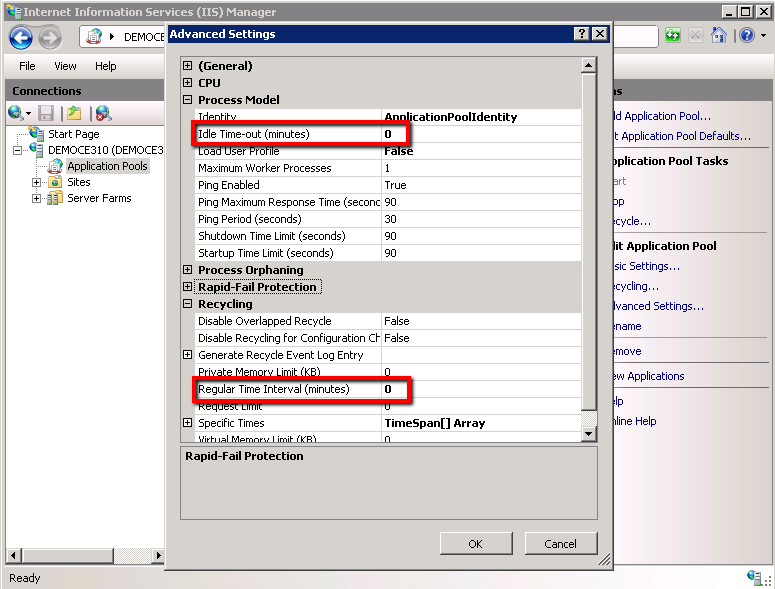 To learn more, read the section Configuring Cache for Primary VM). 17. 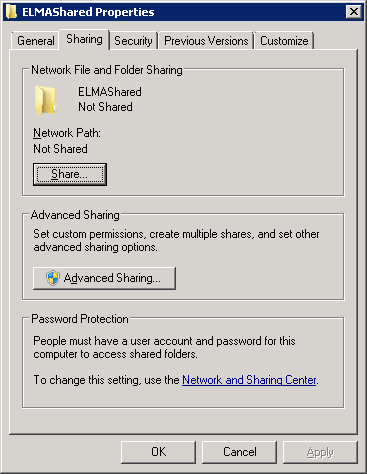 Copy the content of the Web folder to the VM3 server, to the folder C:\ELMA3-Enterprise\Web (replacing its content). Configuring Cache for Primary VM. On the Primary VM2 install App Fabric 1.1 http://www.microsoft.com/en-us/download/details.aspx?id=27115. App Fabric is used for managing the system cache on each of the servers. 1. After installing AppFabric on the web servers, open Primary VM2, go to Start ->All Programs; AppFabric for Windows Server will appear. 7. In the field Caching Service configuration provider select SQL Server AppFabric Cashing Service Configuration Store Provider. - Specify the name of your SQL server (VM name \SQL login) in the Server field (in this case, VM name is VM4, login - (local). - Specify the name of the database for storing the cache in the Database field (in this case - ELMA, it was specified at step 13 of Installing and Configuring Farm Servers). This is not the database, created for Enterprise, it is a new one, for storing cache! 9. Select New cluster. In the Cluster size field, select Small (1-5 Machines). 10. 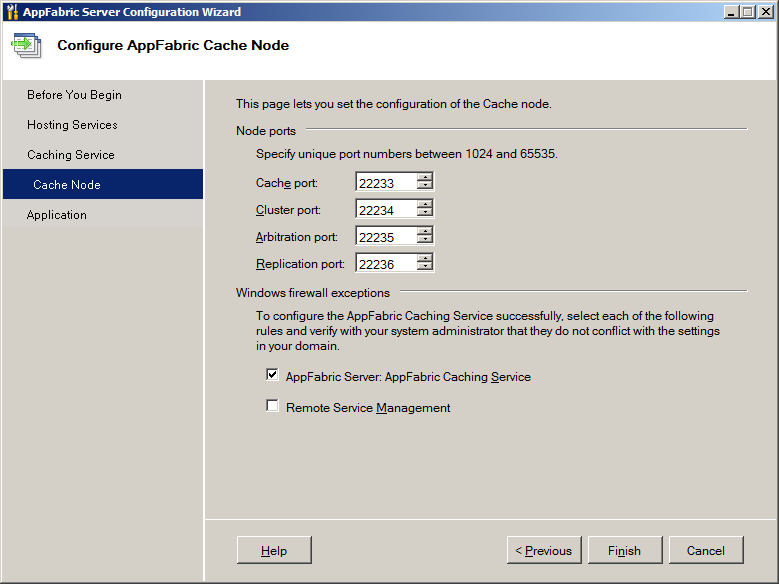 At the fourth step of the wizard, specify the cache node ports and firewall parameters. Leave all the settings by default. Configuring AppFabric on the other web servers of the farm. 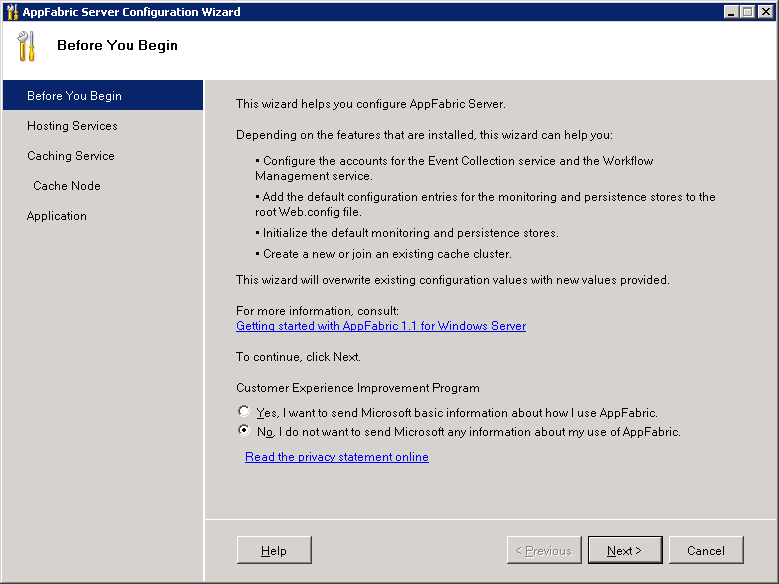 On the VM3 server, install App Fabric 1.1 http://www.microsoft.com/en-us/download/details.aspx?id=27115. App Fabric is used for managing the system cache on the web server. 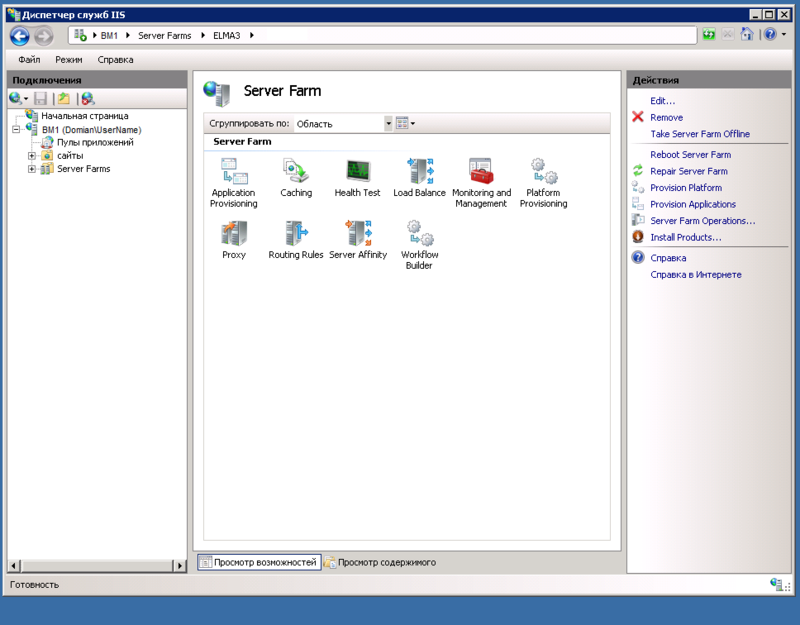 AppFabric settings on the other web servers of the farm are the same as on the Primary server. Start the AppFabric Server wizard: on VM3 go to Start ->All Programs ->AppFabric for Windows Server ->Adding and deleting components. 1. At the first step, refuse to send data to Microsoft. 2. At the second step, leave all the settings by default. 3. At the third step check the box Set caching service configuration. 3.1 Specify the caching service account. It must be a domain account with administrator permissions on all the machines. 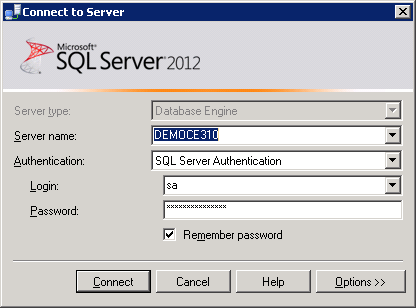 The account must also have access to the SQL server. 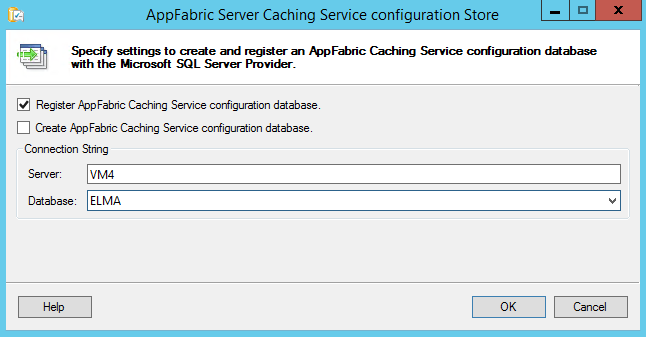 3.2 In the field Caching service configuration provider, select SQL Server AppFabric Cashing Service Configuration Store Provider. 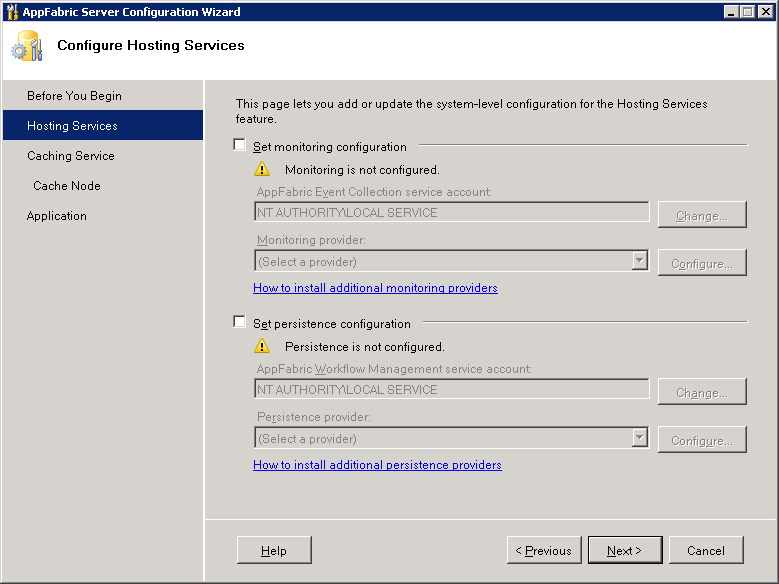 3.3 Click Configure next to the provider name. 3.4 In the opened dialog box, specify the name of your SQL server (VM name / SQL login) in the Server field (in this case, the VM name - VM4, login - (local)). 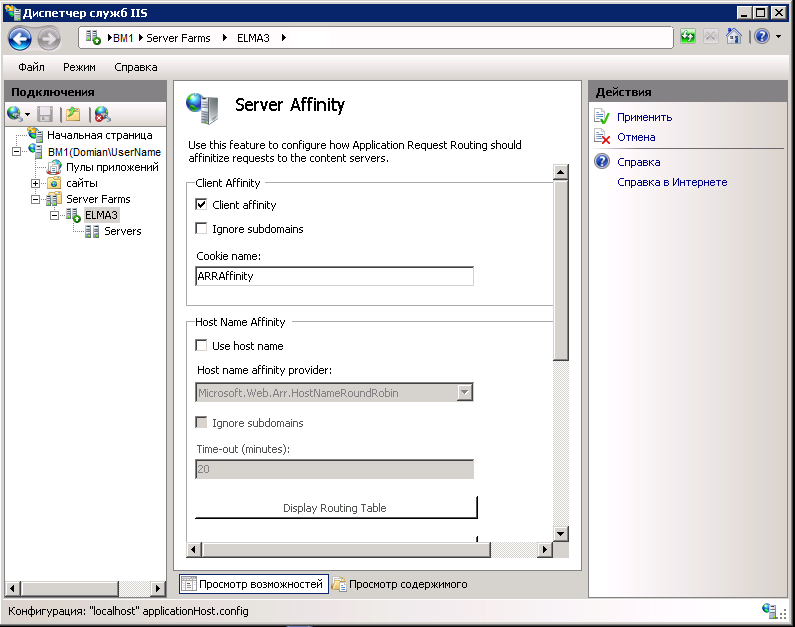 3.5 Specify the name of the database for storing cache in the Database field. It must be the same name as you specified for the Primary server (in this case - ELMA). 5. Select Join cluster. The cluster was created earlier on the Primary server. 6. At the fourth step of the wizard, leave all the settings by default. 7. 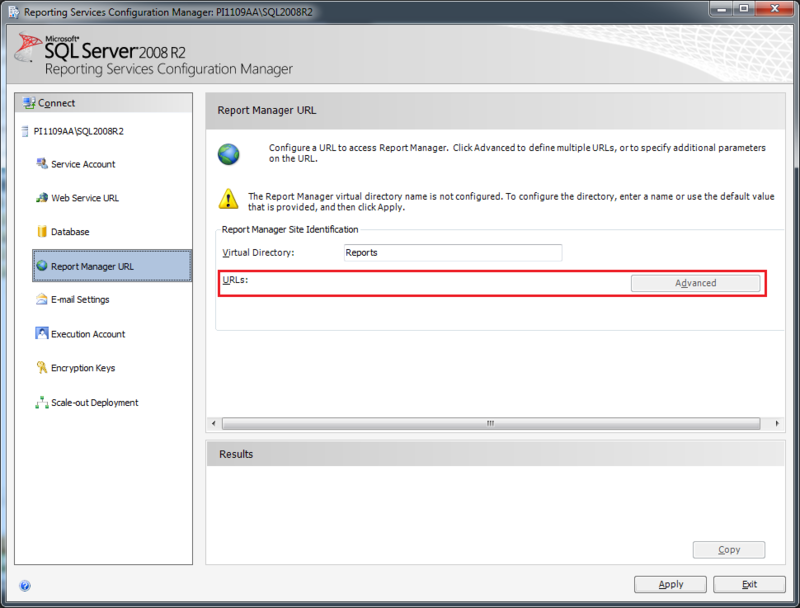 At the last step, make sure that the Start IIS Manager box is checked. On the Primary server, start the PowerShell console as the administrator: Start ->All Programs ->AppFabric for Windows Server ->Cache Administration Windows PowerShell. As the Domain and UserName, specify your domain and a domain username. 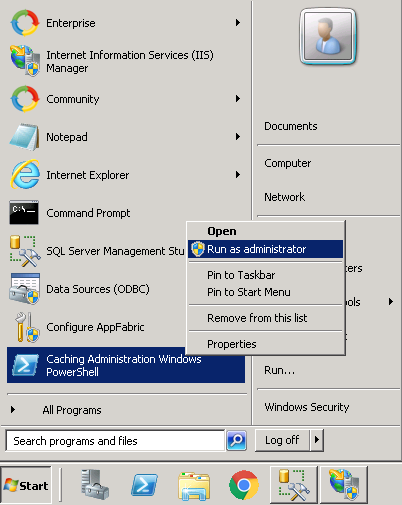 The commands start caching services and grant the selected user access to the cache. 2. On VM3, start the PowerShell console as the administrator: Start -> All Programs -> AppFabricforWindowsServer -> Cache Administration WindowsPowerShell. Creating a Farm on the Controller Server. To show actual IP addresses of users you need to configure additional ARR settings. 2. 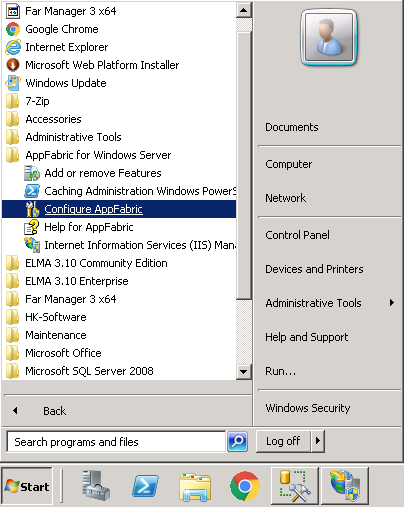 Open the IIS Manager. 3. Find Default Web Site in the tree. a. Set the Idle Time-out (minutes) to 0.
b. Set the Regular Time Interval (minutes) to 0. It is necessary to avoid delays or errors that occur in the case of a timeout or an unexpected restart since all the HTTP requests and responses go through the application request routing system. 6. Right click on this item to open its context menu. 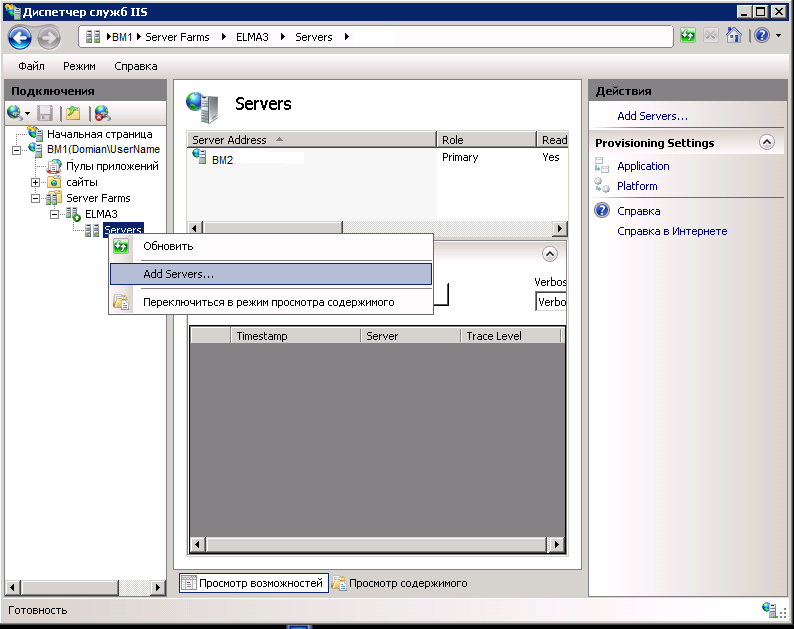 In the context menu, select Create Server Farm. 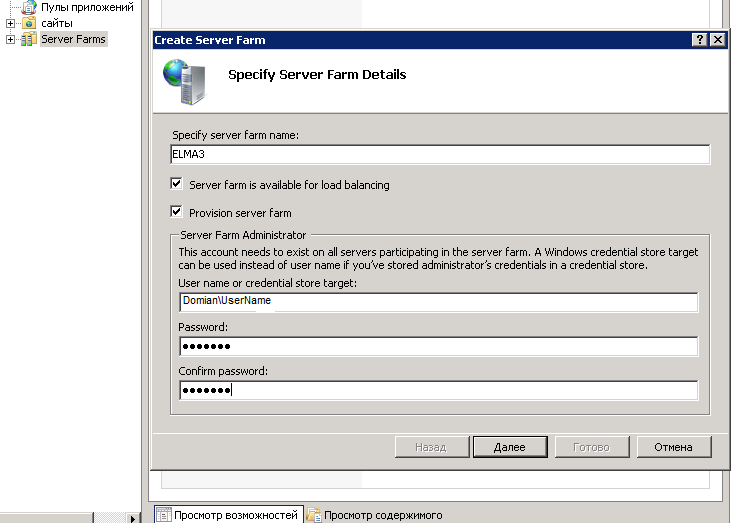 6.1 In the Specify server farm name field, specify the name of the created farm - ELMA3. 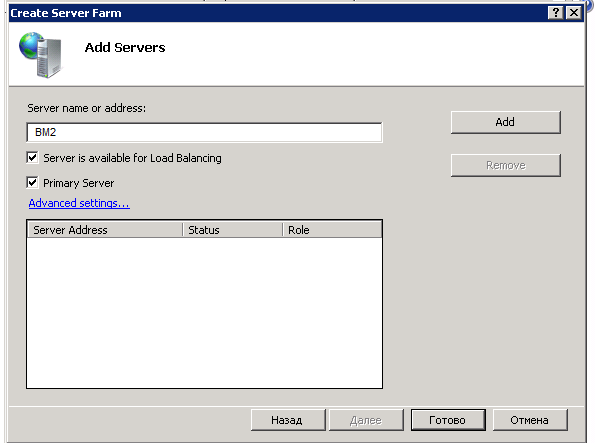 6.2 Check the boxes Server farm is available for load balancing and Provision server farm. 6.3. In the User name or credential store target field, specify the domain name and the username to connect under. In the fields Password and Confirm password specify the account's password. 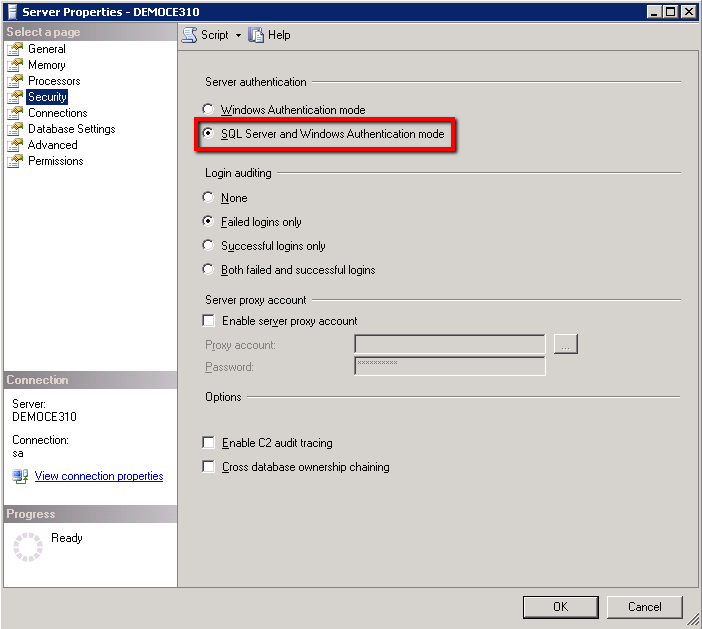 7.1 In the field Server name or address specify the Primary server name - VM2. 7.2 Check the Primary Server box. 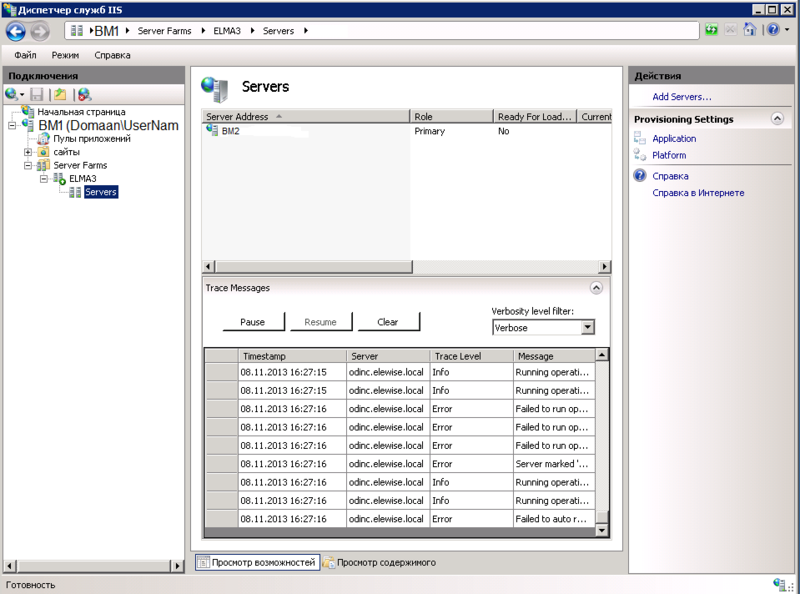 In the IIS Manager tree, under the Server Farm item, a new item will appear - ELMA3. 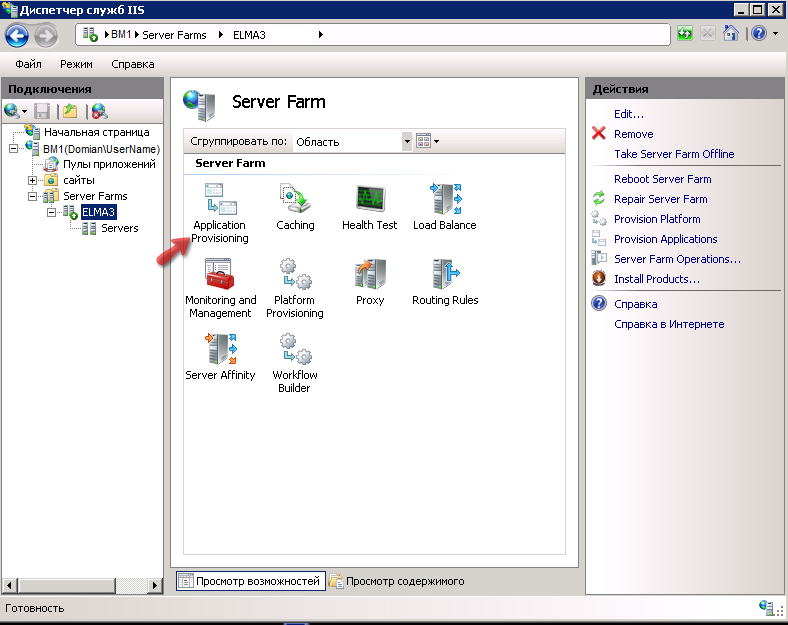 Now you need to configure parameters of the created farm. 13. 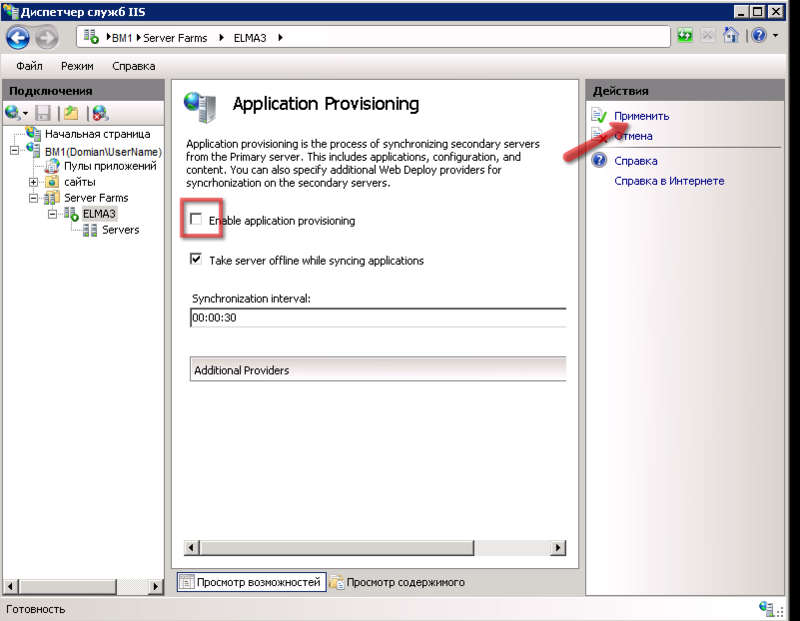 Uncheck the Enable platform provisioning box and click Apply. 15. In the URL field, specify a line like this: http://VM1/StartInfoHandler.ashx?type=Availability, where VM1 is the controller name. In the Interval field, specify 5 seconds. In the Time-out field, set 30 seconds. In the Acceptable status codes field, set 200. Save the changes by clicking Apply. After configuring the settings, add the second farm. Repeat this procedure for all the web servers of the farm. Starting farms for the first time. 1. 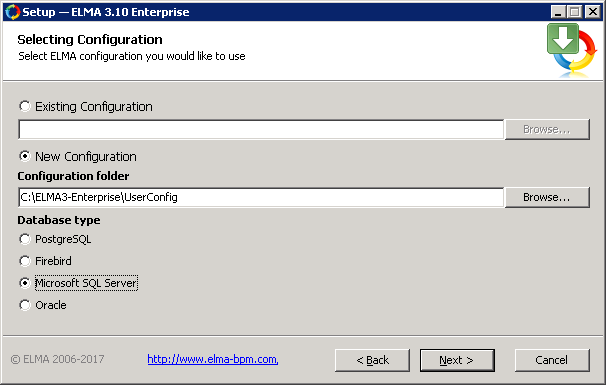 Start ELMA-Enterprise site and pool on VM2 and VM3. 2. Check the http://VM1 - controller server; if error 502 occurred, read the article "Possible errors when starting a farm". 3. 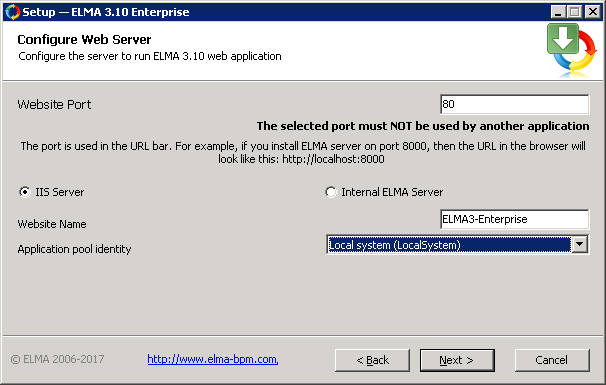 Once the server is started, stop ELMA-Enterprise site and pool on VM2 and VM3. 4. Go to VM2 and open the folder C:\ElmaShared. 5. Create a Reports folder. 7. Rename web.config.xslt.template to web.config.xslt. 8. Now you need to generate a key. Click Generate key. Save the generated key. Add the generated key to the file web.config.xslt. 9.1. <xsl:template match="/configuration/system.web[not(machineKey)]/trust"> - it defines the computer key, so that it is the same on both servers. 9.2. <sessionState mode="SQLServer" sqlConnectionString="data source=BM4;User ID=sa;Password=!Q2w3e4r5t;" cookieless="false" timeout="30"/> - connection to SQL Server VM4; UserID=sa; Password=!Q2w3e4r5t;"
These settings are not required for ELMA 3.11.0 and higher. 10. Rename settings.config.template to settings. 12. This step is executed on VM4. 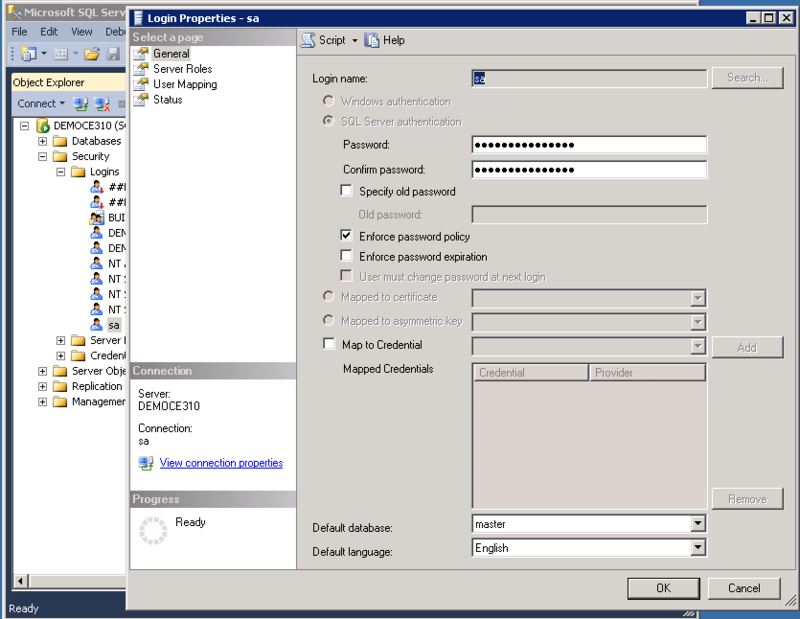 12.1 Connect to MS SQL 2008: Start ->SQL Server Management Studio (ВМ4; User ID=sa; Password=!Q2w3e4r5t;"). 12.2 Open the file C:\Windows\Microsoft.NET\Framework64\v4.0.30319\InstallSqlState.sql (if Windows is 32-bit, then the folder Framework64, is named Framework). 12.3 Execute the file InstallSqlState.sql. 13. 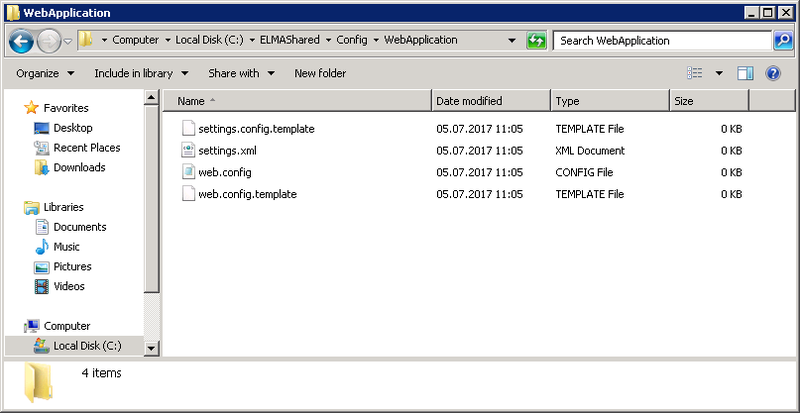 Start ELMA-Enterprise site and pool on VM2 and VM3.